I've gone back and forth in my geeky English Major way between calling it the Flare or Flair Clutch. I decided on "Flare" since it is more physically descriptive but I'll call in "Flair" in my head for my own amusement. I'm excited about the pockets in this bag. 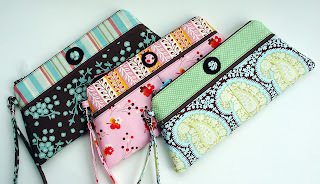 There are two exterior pockets accessed from the same zipper that can hold lipstick, credit cards or slim flip phones. 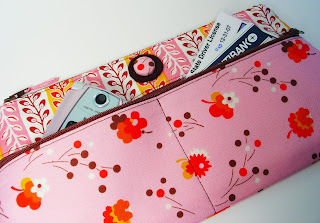 Inside is a slip pocket that is sized to fit cash. I'm hoping to start carrying them in my shop this weekend! Wow, they are lovely! I was hoping to get a nice bag for my mum for Christmas, but I'm thinking I don't have any cute "going out" bags and they would be perfect! The Flare is so adorable. Great design! I'm sure they will be a hit in the shop. Awww, thanks everyone for your kind comments about Flare! What a lovely thing to wake up to this morning! I'm off this list the first one now! ps Hee, Liz. You're very flair-ful yourself and a girl after my own heart! Maia! Your Flare Bags are totally gorgeous...truly just enough Flair! ;) Thanks for stopping by my blog...what a nice surprise! OH MY! 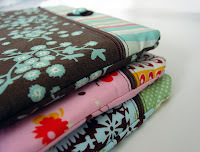 I just found your new clutches!! My birthday is in 6 days and I will have to treat myself to one. I think I deserve it don't you? I bought my step-daughter one of your beautiful wrislets for her birthday last year. She fell in love. "That's a lot of cards, Mommy!"